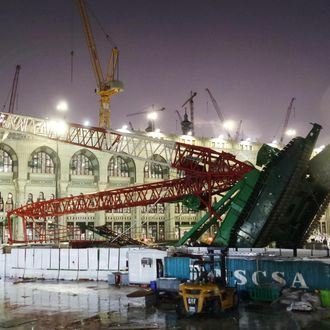 At least 65 worshippers are killed and others injured when storms caused a crane to fall in Mecca's Grand Mosque. An enormous red crane crashed into the ceiling of the Grand Mosque in the holy city of Mecca on Friday, leaving at least 65 people dead. The annual Hajj pilgrimage to the Saudi Arabian city and the Grand Mosque — one of the holiest sites in Islam — is set to begin in the coming weeks, and the city was preparing for millions of religious visitors. The Grand Mosque was in the process of being expanded so it could accommodate more people making the pilgrimage. Saudi Arabia’s civil defense authority said the accident was caused by intense sand storms. An additional 154 pilgrims were reportedly injured; photos on social media showed many bloodied and bandaged people outside the mosque. The sheer number of people visiting Mecca for Hajj has caused accidents many times before: Hundreds of people were killed in a stampede in 2006, more than a thousand were trampled in 1990, and fires and stampedes in other years killed thousands more. The Saudi government has worked in recent years to keep expanding the city’s spaces to prevent these things from happening; as today shows, the construction has its own dangers.